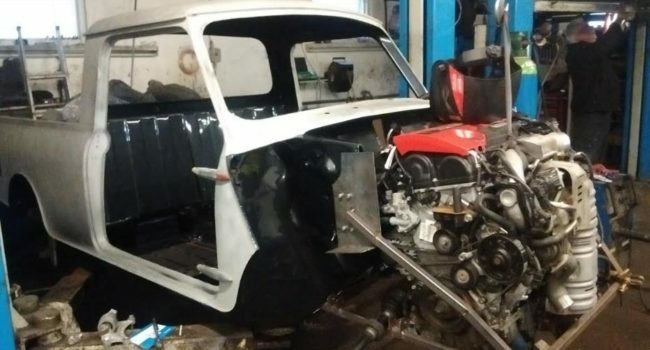 Mark Greens projects Austin mini Pick up 1979 for Santa Pod drag race. Now the shell as arrived and been painted we have acquired £6k engine Honda civic type r fn2 Turbo 320 Bhb. Front wheel drive customer choice. Engine is being offered up to the pickup. Manufacturing engine mounting so attach engine to sub frame this are supplied by another company which poll bush. We have started manufacturing suspension arm/components, this will enable us to run 15 inch wheels at the front and 13 inch at the back this will make the car sit level. Geoff Watson known for the first Honda powered mini. The glass is a customised unit due to the conversion from sliding panel window and is now a whined down window so that it is more like modern day style. This has had it problems due to the glass being small pieces, which were 15mm thick triangular units. These were too small for toughening; this was resolved by laminating the units.